I went to check on their condition this evening and I can find no trace of lice except on the rooster and all hens have the redness in their skin turning back to pink/white. Also their legs look to be improving as many scales have fallen off. I must say that the Ivermectin is indeed effective despite suggestions to the contrary. The dose we provided was around 0.1 - 0.2ml on the back of the neck. We decided to follow up again today and also give a larger dose to the rooster as he is still suffering badly and has absolutely enormous egg clumps below his chest. Glad you are seeing some good progress. 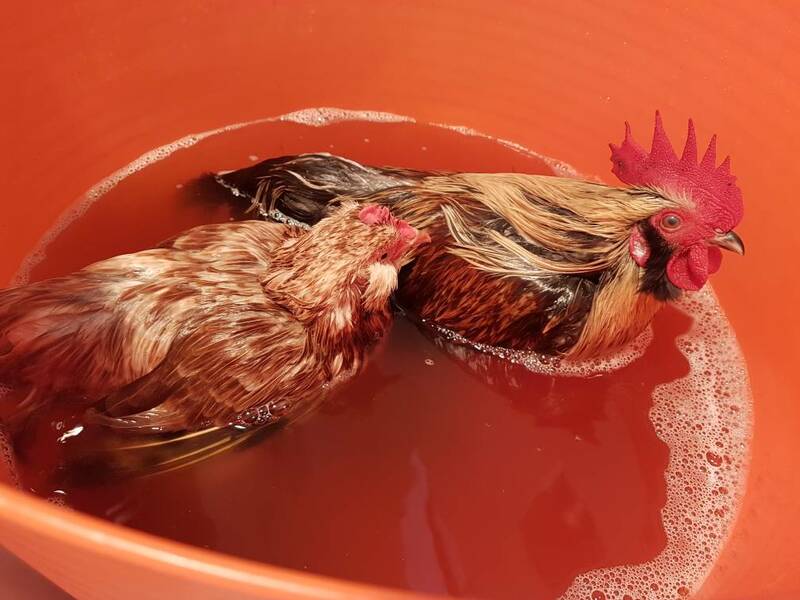 Get rid of the lice eggs on the rooster rather than risking them hatching (save them to show the owners) They won't wash off. You will need to cut or pluck. Also look under the wings. I was surprised to find some big clumps there on a 'rescued' bird. They must be feeling sooo much better. When the bottle turns up decant/split it into two (shake it well first) and offer to share it with the owners of the chickens for the cost you paid. Progress update: They are improving so much and are getting cheekier every day. So nice to see them healing. Long ways to go but at least they are healthy in every other way. Thankfully only one problem at a time! Yay! The second, larger dose of ivermectin did the trick. I've just checked on Archie the rooster and he is totally lice free. Ivermectin definitely has worked for all chickens. 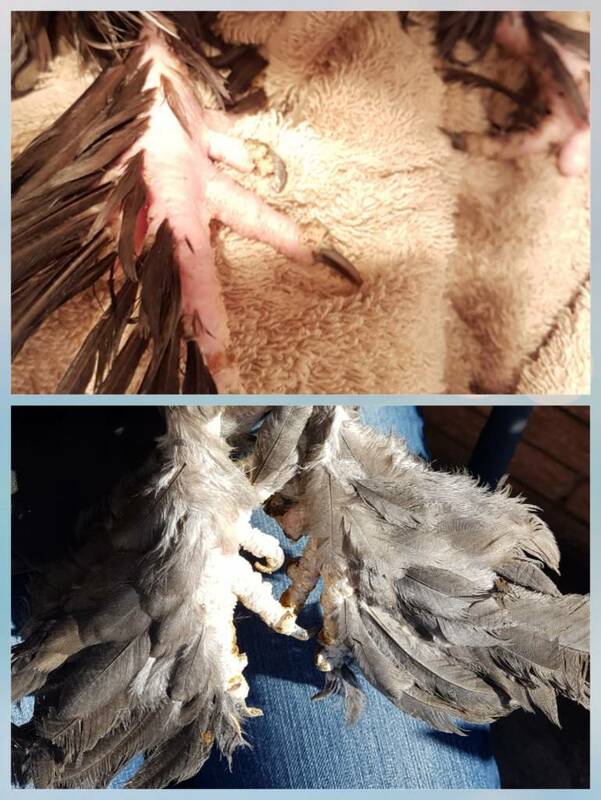 I'll keep checking him to see how his skin heals up after so much abuse and provide 2 more doses over the next few weeks to kill any eggs they may still hatch. I'm absolutely thrilled. Also great to see your birds looking happy in the bath shanygirl. I have a new found hate for parasites. hello - i bought some ivermectin from the vet a couple of years ago but still have some left. I want to treat the chooks but there is no useby date on the bottle ( she put some in a bottle for me as only have 10 birds, but i still have it). Seems this also works for lice and worms. I have been buying liquid wormer from the produce store (whatever is available) but am not confident the birds are drinking it. Would rather another method so if ivermectin is good, then will just use that. A quick google suggests that unopened it has a shelf life of 3 - 5 years however given that this has been opened, decanted and possibly exposed to heat and light I would replace it with some fresh. Moxidectin plus will treat internal and external parasites (including Tape worm) - Most produce products are Levamisole which does not treat Tape. Order this on line from Gecko Dan (The Chook shop) or the Knox Bird Clinic. Order a 1ml and a 5 ml syringe at the same time and direct dose by weight. thank you Sue55 for responding so quickly. How do you administer this? The vet asked me to do put 1 or 2 drops of ivermectin on the skin at the back of the neck. This was really easy and was confident of administering properly. I don't think they drink water when i put wormers into it. So can moxi be put onto the skin like invermectin? There are two formulations of the dectins (well actually 3 - injectables) either spot ons - there is some dispute as to whether they are properly absorbed by poultry as they work best onto adipose (fat) tissue, and the orally dosed ones. These can be added to water but are very bitter and chooks may be reluctant to drink, or direct dosed by weight (Moxi Plus approx 0.5 ml/kg). Direct dosing is much easier than you may think and is the most reliable and economical. It is the Plus component (praziquintel) which targets Tape Worm. Skin treatment is 'spot on' or topical. Direct dosing is oral. Different formulations of the same product for each method. thanks again. sorry to be a pest but just want to learn. so does one dose by opening the beak and getting the does in via syringe? I am very keen to get the dose in and easy so want to understand this. thx again. Yep - the first one is the hardest. After that it's simple. If you order Moxidectin Plus (online) also ask for a 1ml and a 3 ml syringe. CRIKEY CAM! But would definitively like to do this as seems the best way to ensure that they are getting the right dose. i am searching methods of doing this on youtube. if you/others have seen a good video, can you please send me the link. I can get my hubby to assist to make it easier. only 9 birds to do. also - is there a period after where you don't eat the eggs? thanks so much. this is all really helpful. It is really easy if you don't get yourself stressed out and I think easier with one person - I do up to 150 birds over a week. Sit, or put one foot on a small stool, chook on lap or knee, held securely with your non dominant arm over and around them to immobilise. That hand will still be free to hold their mouth open (hand over head, chook clamped to you with arm/elbow). Open beak (pull on comb or wattles) and deliver meds with syringe. Chooks don't see well in blue light and if they can't see they tend to be relaxed - I have a trouble light set up in the garage with a blue globe for chooky chores - or just do it in dim light. To weigh them I have a cheap luggage scale hanging from the rafters - pop chook in 'green bag' and hang from the scale - approximate is close enough to weigh and dose - there is room for error with the Moxidectin. Every one gets uptight before they do this the first time - then they come back and say how easy it was.